Well despite the best efforts of Royal Mail to deny me, the calipers have arrived. Just need to get a 2.5mm spacer which is being made up for me by a helpful TDR-er and then get on to Ryan at moto-racingspares for some Dual Carbon pads. 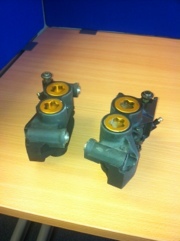 As you may have noticed from the title, they are R6 not R1 calipers, these are however the same on each machine. These particular ones are off a fellow racer who is going to the Triumph Triple Challenge this year and selling off bits off his R6 he raced last year. Nice upgrade that matey. Are the Gixer ones that poor…if you need any Lathe work in the future drop me a line. Cheers for the kind offer, I’ll keep it in mind.